With Advanced Ads Pro you can define which browser or device should be able to see an ad with the user agent visitor condition. To display an ad on a specific browser, search for the Visitor conditions metabox and add the user agent condition. User Agents, the identifier for browsers (and devices) are constantly changing. 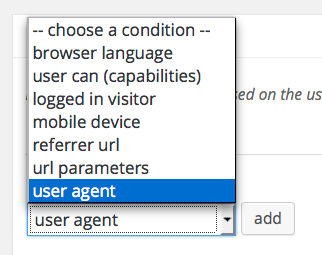 Therefore, Advanced Ads doesn’t provide a list of user agent you can choose from. You can find the identifiers for many browsers on pages like this.